Diversey Suretouch 1-Step DfE-Certified AHP Disinfectant Cleaner SKU#Diversey-100870118 - 12 x (32Oz, 1 Quart, 946ml) RTU Bottles with 2 x Trigger Sprayers. 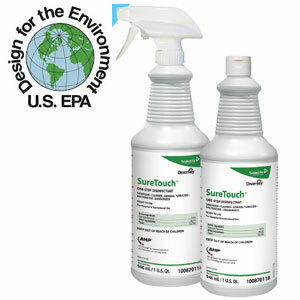 SureTouch is a 1-Step Disinfectant, Sanitizer Cleaner for use as a General Virucide, Bactericide & Deodorizer. 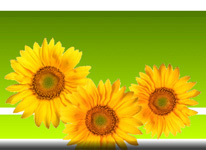 This Design for the Environment (DfE)-certified disinfectant is powered by Accelerated Hydrogen Peroxide (AHP) technology with citric acid and proprietary Diversey surfactants, EPA Registration #70627-78. It provides effective disinfection against bacteria and viruses (including MRSA, VRE, Influenza, Poliovirus Type 1 and Norovirus) within 5 minutes, while being compatible with most hard, non-porous surfaces. Environmentally Responsible - classified in the least-hazardous class (category IV) of the EPA's acute toxicity category hierarchy, containing no VOC-emitting ingredients with no added fragrances. Suretouch cleans, disinfects, and deodorizes in a single labor-saving step, disinfecting in just 5 minutes and it can be used as a 30-second sanitizer on non-food contact surfaces. The Ready-To-Use (RTU) format requires no mixing or measuring of chemicals, for a safer workplace, and SureTouch disinfectant's active ingredients break down to oxygen and water after use, so it is non-irritating to eyes and skin. 1 Quart Bottle, 12 Bottles & 2 Trigger Sprayers per Case.